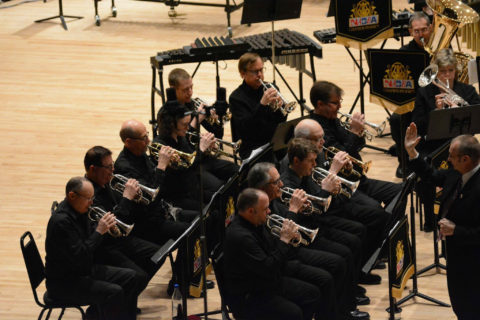 The Rockville Brass Band is the perfect place for amateur players looking to move up to the next level or for high-school band directors and other semi-professional players looking for opportunities to play more demanding music. The British style of brass band sound is one of the most exciting musical sounds ever. If you’re not familiar with playing in this type of ensemble, then you’re in for an unforgettable experience with the Rockville Brass Band. The Band plays a wide variety of genres, from marches and transcriptions of well known music, to serious and demanding original works. By performing entertaining, quality concerts to audiences within the DC metropolitan area and beyond, we aim to be ambassadors for the sound of brass and percussion. The Band has approximately 30 brass and percussion players. It is under the baton of Nigel Horne, an English conductor steeped in the tradition of brass bands and with many years’ experience playing in and conducting brass bands of all levels. To get a flavor of what you get out of playing in a group such as the Rockville Brass Band watch this video. You will be expected to be a committed player of a good standard. We don’t use trumpets or French horns, but players of those instruments are welcome to apply to join on cornet or alto horn. Please note that in a brass band, baritone horns (which are members of the saxhorn family) and euphoniums (which are tenor tubas) are considered different instruments and have different parts. Also, in a brass band the baritone, euphonium, tenor trombone and tuba parts are all written in transposing treble clef. Players of those instruments would gain most if they can read, or be willing to learn to read, treble clef. The Rockville Brass Band rehearses on Wednesday evenings 7:30pm to 9:30pm from September to June just north of the Washington DC Beltway at Newport Mill Middle School, 11311 Newport Mill Rd., Kensington, MD 20895. Our season usually consists of about 3 concerts in November and December, and 4 concerts in May and June. Why not give us a trial run? We have players from as far away as Baltimore and La Plata, MD who drive far to soak up the challenging, yet fun, experience. We’re confident you’ll have a great time and we’d like to meet you. For an informal chat and a discussion about our instrumentation and audition process, please contact us by e-mail. And don’t forget to visit our Facebook page.